PUSH FOR LUCK Project Archive, 2012. 4.25 x 6.87 in, 98 pages. According to a New York Times article in February of 2004, New York City deactivated most of its pedestrian crosswalk buttons, and the buttons that still exist function only as mechanical placebos. Any benefit from pushing the buttons is only imagined. 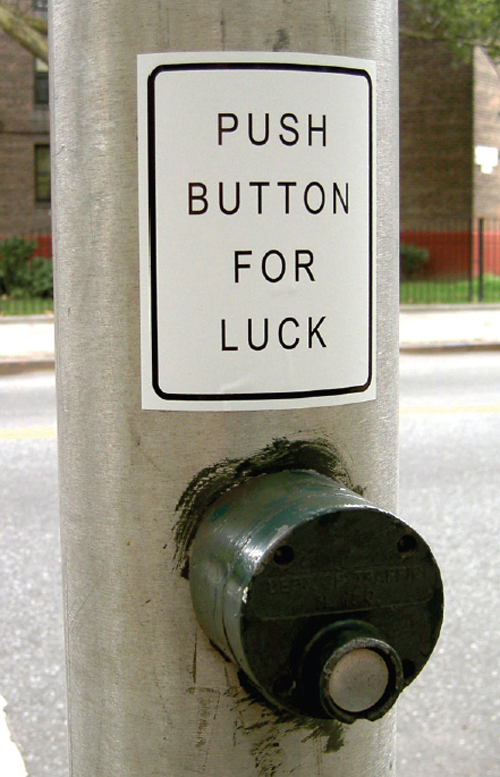 As a response to this article, a sticker sign was placed on hundreds of crosswalk poles in Queens, Brooklyn and Manhattan over several months in 2004 and early 2005. This book is a collection of photos documenting the project. For years, at thousands of New York City intersections, well-worn push buttons have offered harried walkers a rare promise of control over their pedestrian lives. Most of the buttons scattered through the city, mainly outside of Manhattan, are relics of the 1970’s, before computers began tightly choreographing traffic signal patterns on major arteries. They were installed at a time when traffic was much lighter, said Michael Primeggia, deputy commissioner of traffic operations for the city’s Transportation Department. The first ”semi-actuated signal,” as they are called by traffic engineers, is believed to have appeared in the city in 1964, a brainstorm of the legendary traffic commissioner Henry Barnes, the inventor of the ”Barnes Dance,” a traffic system that stops all vehicles in an intersection and allows pedestrians to cross in every direction at the same time. Barnes was also instrumental in completing the one-way conversion of major avenues in New York. By the late 1980’s, most of the buttons had been deactivated, their steel exteriors masking the lie within. But city officials say they do not remember ever publishing an obituary, and the white and black signs stayed up, many of them looking as new and official as ever. But Ms. Ceesay was at that moment baby-sitting for 4-year-old Benjamin Miles. Despite his baby-sitter’s explanations that the buttons ”never work,” Benjamin still pushed away at the intersection of Atlantic Avenue and Henry Street. Why? Push for Luck Project Archive: $15. includes shipping regular mail within the USA/Canada. For shipping outside the USA/Canada please email for an estimate before purchase [ hn (at) heidineilson (dot) com ].